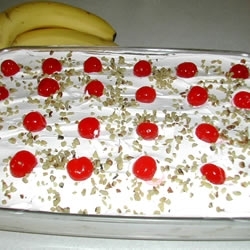 This homemade banana split cake recipe is DIVINE. I love banana splits and this cake reminds me of when I was young trying to eat the banana split before it melted. What's your favorite ice cream flavors? We always had a scoop of vanilla, one of chocolate and last (but not least) a scoop of strawberry ice cream. I would drizzle it with chocolate syrup and top with whipped cream. I always would cut the banana into bite-sized pieces to make it easier to eat. Guess what I am craving right now? This recipe uses a strawberry glaze that is delicious. I hope you enjoy this as much as I do. So easy to make and great for the kid's birthday party. Offering many more cake recipes below. The secret is the homemade strawberry glaze and whipped cream - taste for yourself. Mix together the sugar, cornstarch and Jell-O in a medium saucepan and bring to a boil for one minute. Remove from the heat. Fold in the sliced strawberries and toss until well coated. Chill in the refrigerator for now. In a bowl, mix together the graham cracker crumbs and melted butter. Press into the bottom of a 9x13 pan. Bake for 15 minutes; cool. In a large bowl, combine the cream cheese, butter and powdered sugar, vanilla; beat until smooth. Spread over the cooled graham cracker crust. Next, arrange the banana slices, then the crushed pineapple. Bring the glaze out of the refrigerator and spread over the pineapple. Spread the whipped cream over the strawberry glaze. Arrange the cherries over this and finally sprinkle with the chopped nuts. Chill for a minimum of 4 hours before serving. You'll be serving this banana recipe again and again.